. . . . Admiral Hobson then presented Captain Frank Smith, New York State Narcotic Supervisor, who explained that New York State has had the Uniform Narcotic Act upon its books since 1933, but that enforcement is hampered by lack of funds. He stated that licenses had been issued to 219 concerns, and that, as resources permitted, educational work was carried on to acquaint police departments, pharmacy colleges, and the public with the drug evil. He stated that moving pictures were used in educational work to aid police in the identification of Marihuana, and that much marihuana was being grown in New York State, but that strong efforts were being made to stamp it out. Extracts from this address are printed below. New York State enacted the Uniform Narcotic Act during 1932 when it became Article XXII of its Public Health Law. With an appropriation one investigator was appointed in 1934, April 1st. "As a result of this activity 219 Licenses were in effect on January 1, 1936, these being issued to wholesalers and manufacturers of narcotics. The legislation adopted includes control of [ ---] and exempt narcotic preparations. In addition to the opiates, cannabis sativa was included in the list of narcotic drugs. In the issuance of licenses a personal investigation of each applicant was made to. determine his qualification as to equipment, business facilities, moral and financial responsibilities. "With an intent to prevention rather than prosecution, addresses have been made during the past two years before senior students of colleges of medicine and pharmacy, medical associations, pharmaceutical organizations, and health officers. Police officers, probation and parole officers, have been similarly addressed. Many civic organizations including Rotary, Kiwanis, Monarch and Lions Clubs have requested such discussions. "At most of these we have been able to exhibit one reel of 16 mm moving picture film which the Department of Health produced last Fall. The film will provide a means of identification of Cannabis (Marihuana) which can be used throughout the State to aid in enforcement. We are also furnishing some illustrations to every police executive in the State to be posted in his precincts in order that officers may familiarize themselves with the plant. "Enforcement is progressing. Police agencies alone report over 2000 arrests during 1935 for violation of narcotic laws of New York State. This brings our total to more than 5000 for three years. Definite figures are not yet available but it is estimated that ten percent of the arrests in 1935 are for violations involving Cannabis. New York City Police and Health Departments in cooperation with the State Department of Health destroyed 185 tons of Cannabis during 1935. One ton was also destroyed in two of our upstate cities. Cannabis cigarettes have definitely been found throughout several cities situated from the eastern to the western boundaries of New York State. . . . . 'Welfare and correctional workers are showing considerable interest in narcotic enforcement particularly with reference to Cannabis. This material is reported to be appearing in magazines and in the literature of salacious type. This together with the release of inhibitions effected in smoking Cannabis makes the subject of interest to those persons concerned with counteracting antisocial agents. . . . .
Admiral Hobson then paid a tribute to the late Dr. Hamilton Wright as co-pioneer with Bishop Brent in organizing the international and national fight against the "dope-ring", whose devoted services find enduring monuments in the Narcotic Laws of the 'United States and the provisions of international conventions. He then presented Mrs. Hamilton Wright who delivered an address on behalf of Mr. Harry Anslinger, Commissioner of narcotics. Mr. Anslinger’s address reviewed briefly the history of the International movement to curb illicit narcotic traffic, and also the history of the movement in the United States. The address stated that this country alone cannot effectively stop the evil since the sources of it lie outside its borders. Mr. Anslinger warned of the rise of Marihuana in the United States. Mrs. Wright, after delivering Mr. Anslinger's paper, spoke extemporaneously concerning her late husband's distinguished activities in the field of narcotic control, and discussed broadly the whole problem. The theme of her remarks was an appeal that the source of the evil be restricted, namely, the growth of plants used in making narcotic drugs. 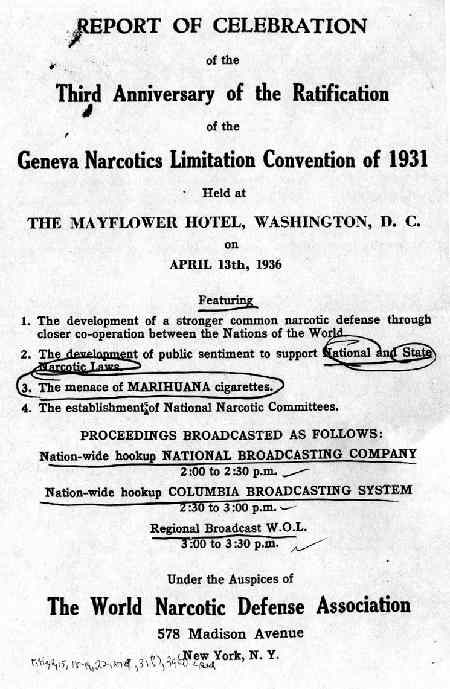 The text of Mr. Anslinger's paper is printed below: . . . .
. . . . "Another urgent reason for the early enactment of the Uniform State Narcotic Act is found in the fact that it is THE ONLY UNIFORM LEGISLATION yet devised to deal effectively with MARIHUANA, there being no Federal legislation whatsoever on the subject. “One of the most troublesome problems which confronts us today in the United States is the rapid spread of the use of MARIHUANA. We are daily receiving reports of its abuse, and of violent crimes committed by persons while under its influence. Its user is quickly reduced to fear and insanity. “The present situation with regard to the illicit use of MARIHUANA is so alarming that all states and communities should act IMMEDIATELY to provide vigorous measures for the extinction of this lethal weed, the smoking of which has spread over the country almost like wildfire. "The seizure by various State agencies throughout the land of approximately TWO HUNDRED TONS of Marihuana during the past year, furnishes cause for grave concern on the part of all serious-thinking citizens. “The World Narcotic Defense Association is performing an admirable task in acquainting the public with the Marihuana danger which has assumed such amazing proportions.